This multiday apparitions have occurred after a series of reports of moving statues in Ireland in 1985. In August of 1985, in the small village of Melleray, Cappaquin, Co.Waterford, Ireland, Our Blessed Lady appeared to some of the locals for a period of 9 days. During those 9 days She gave the visionaries a messages for the Irish people and the whole world. During the course of these days the visionaries were given visions of many extraordinary supernatural events. Melleray Grotto is a little grotto located one mile below the Cistercian Monastery of Mount Melleray in the Knockmealdown Mountains in Waterford County, Ireland. The Cistercian Monks of the Strick Observance (Trappists) came to this area in 1832. They set up the Grotto in 1982. High on the cliff face is set a statue of Our Lady of Lourdes, which is the site of the apparitions. By the side of the Grotto flows the small Monavugga River. 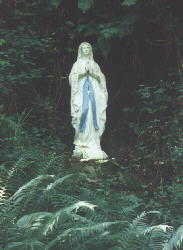 The statue of Bernadette was placed near the stream. Three benches and kneeler were placed in semi-circle around the statues. After the events some improvements in the site were made. Nowadays the area reserved for devotion is still relatively small and capable of accommodating only about one hundred and fifty people. Barry Buckley, 11 years old, the two youngsters who claimed to see the Virgin each night over the course of five days. Our Lady spoke of how God was angry with the world and how we must change. If we don’t change, then, She said, “the devil would take over God’s church in ten years”. “My Message is Peace and Prayer and no more fighting in the world”. “I want the Irish people to spread my message to the world”. 1. Peace is flowing like a river,flowing out of you and me.Flowing out into the desert,setting all the captives free. 2. His love is flowing like a river,flowing out of you and me.Flowing out into the desert,setting all the captives free. 3. His healing’s flowing like a river flowing out of you and me.Flowing out into the desert,setting all the captives free. 4. Alleluia, alleluia.flowing out of you and me.Flowing out into the desert,setting all the captives free. 5. His peace is flowing like a river,flowing out of you and me.Flowing out into the desert,setting all the captives free.